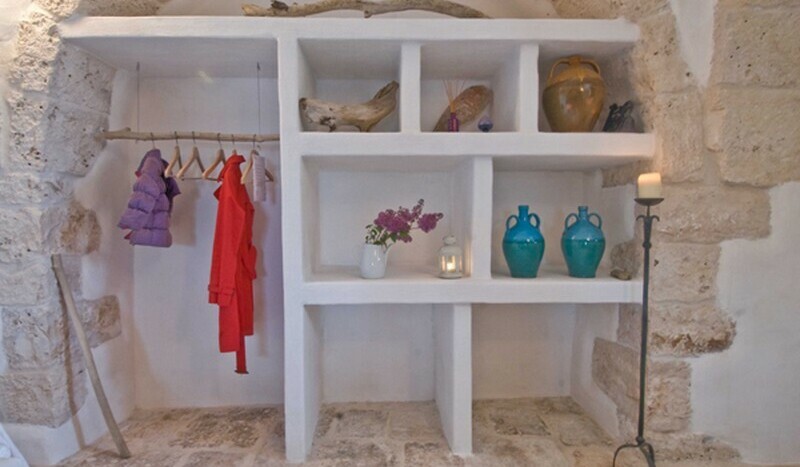 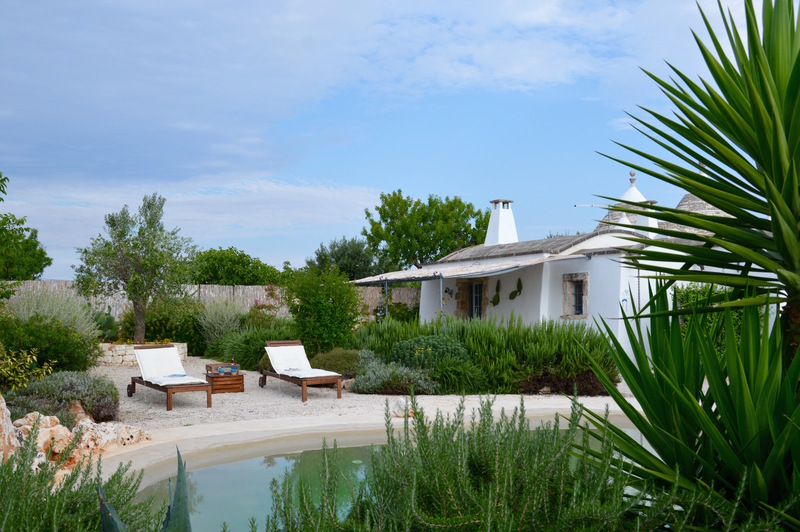 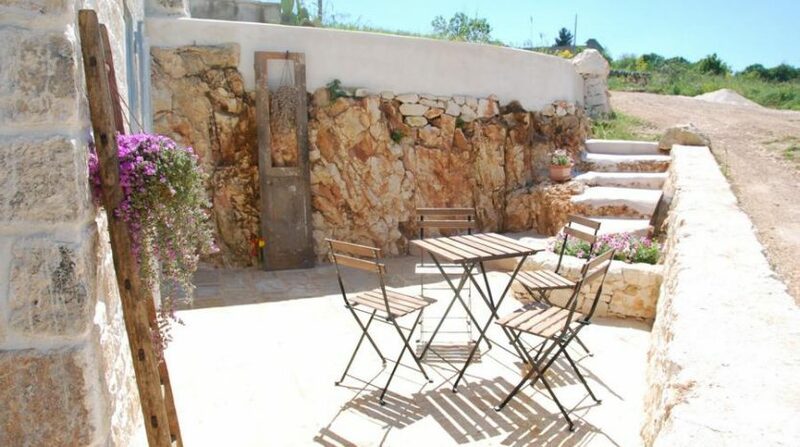 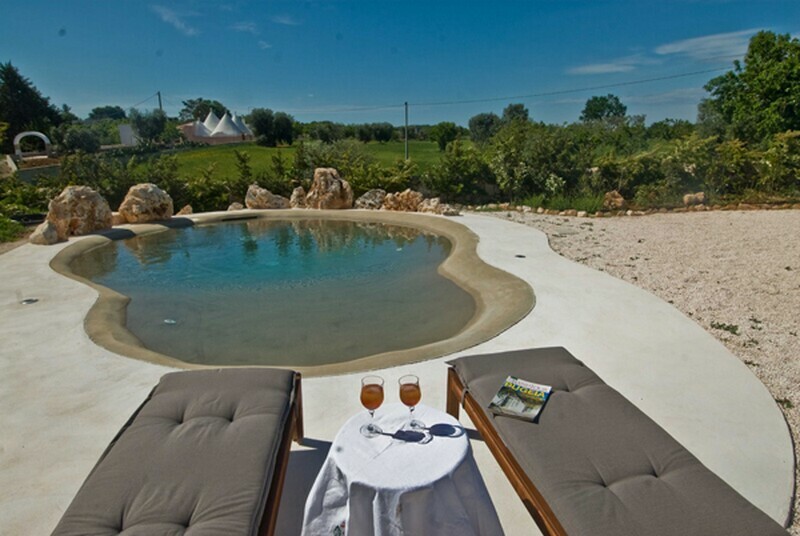 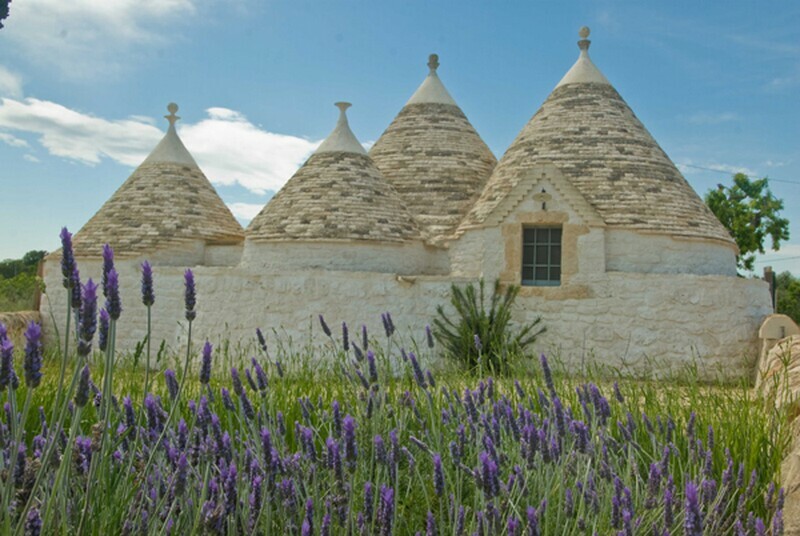 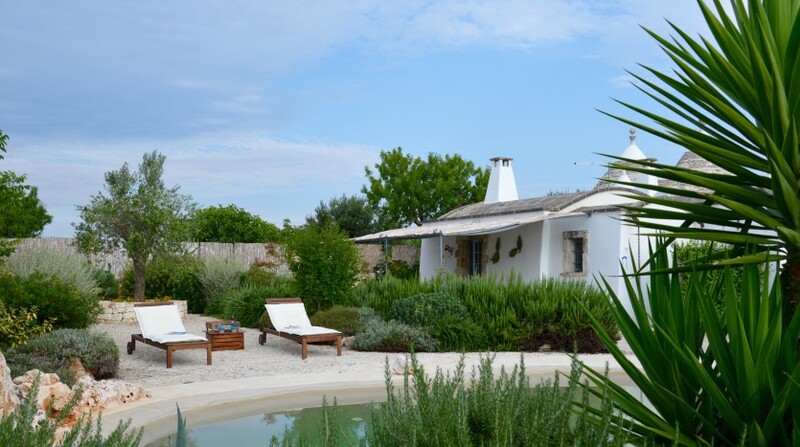 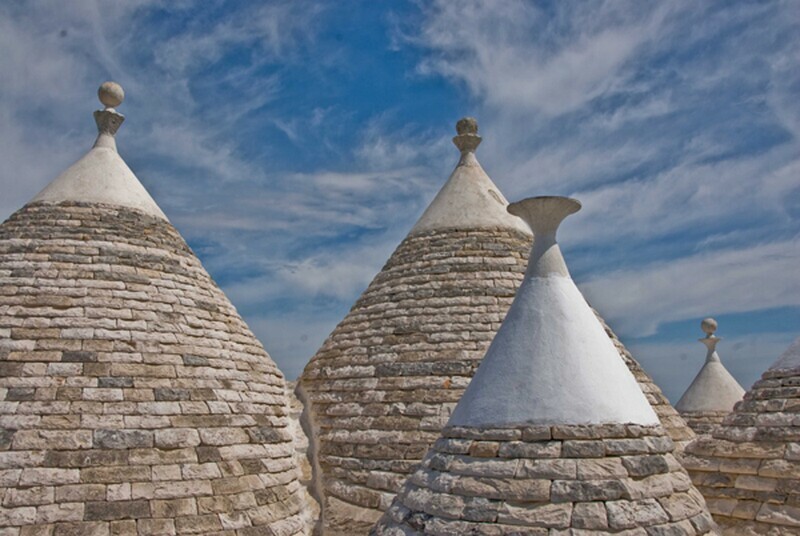 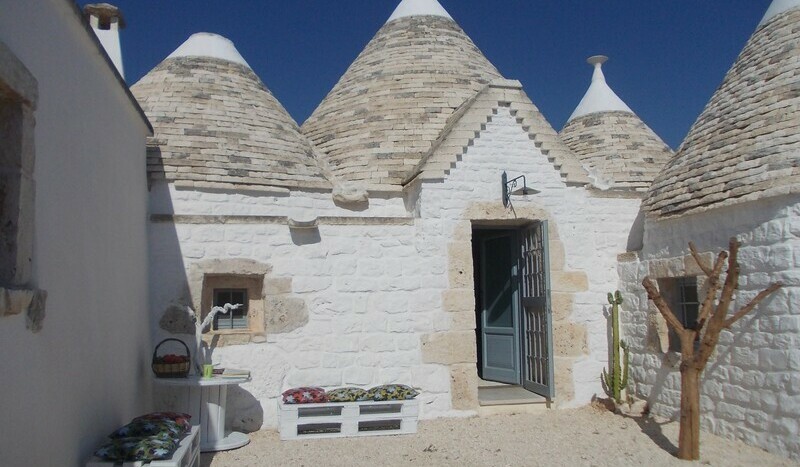 A romantic trullo, ideal for elopements and ageless lovers. 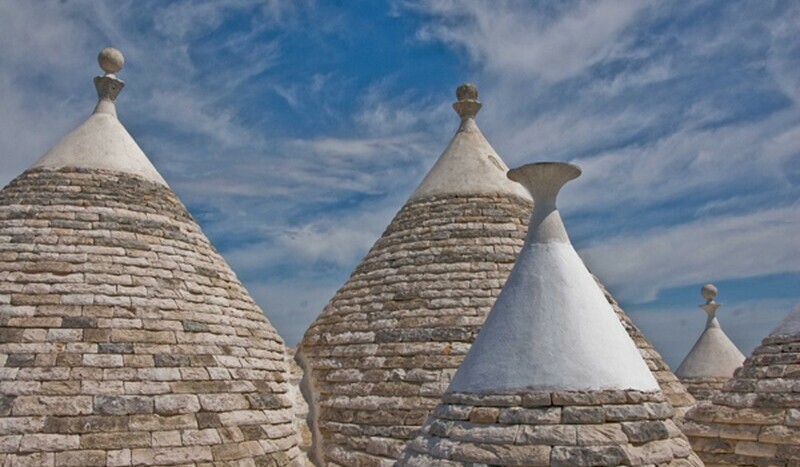 The structure is typical, like colors, flavors, panorama and even that relaxing feeling that only Puglia is able to transmit. 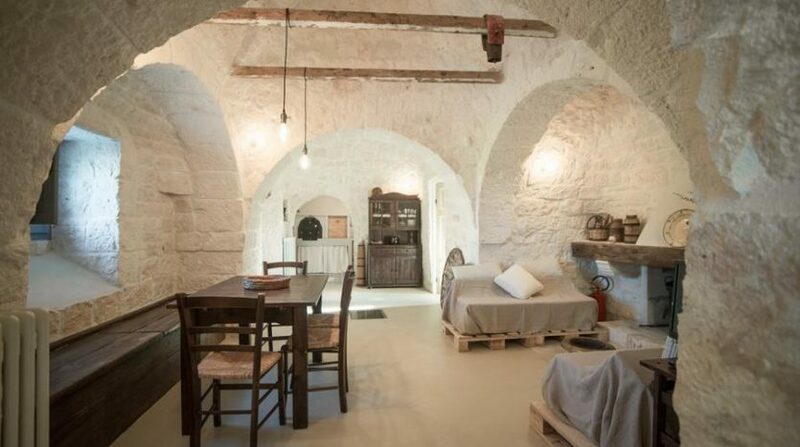 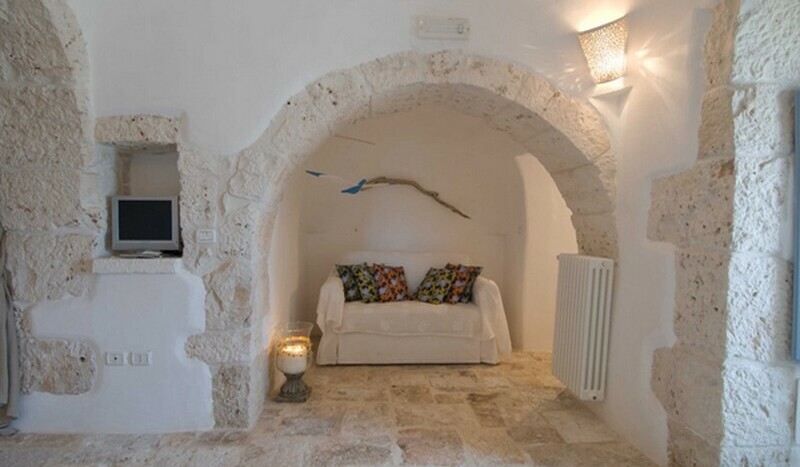 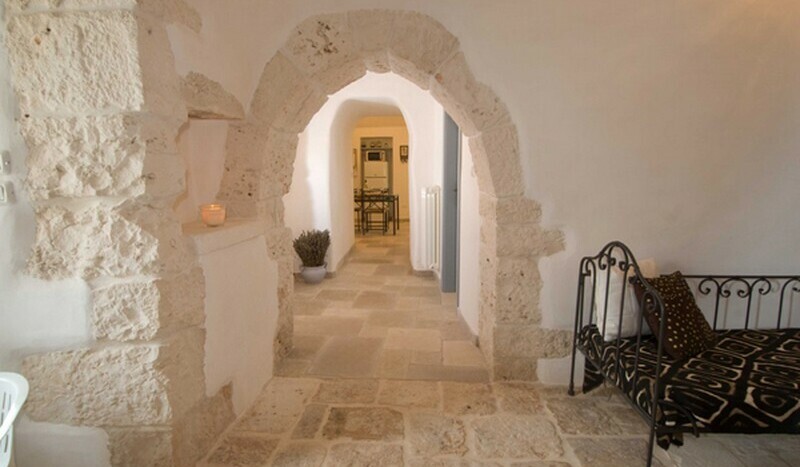 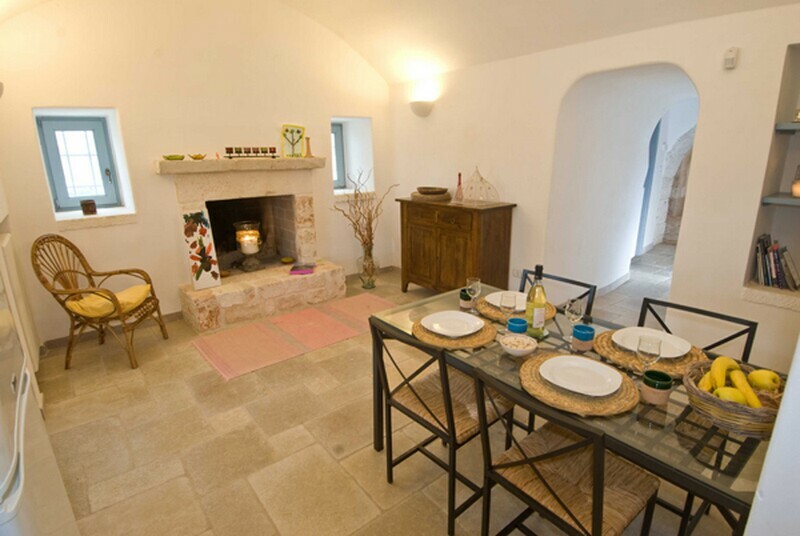 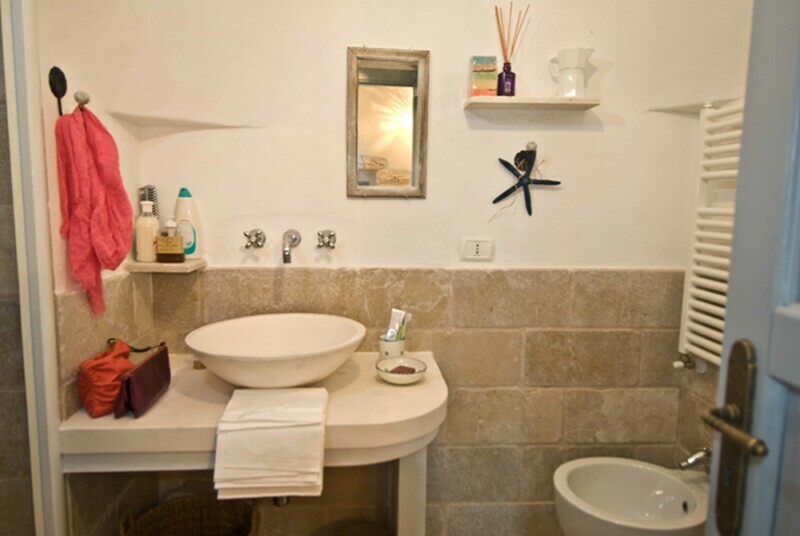 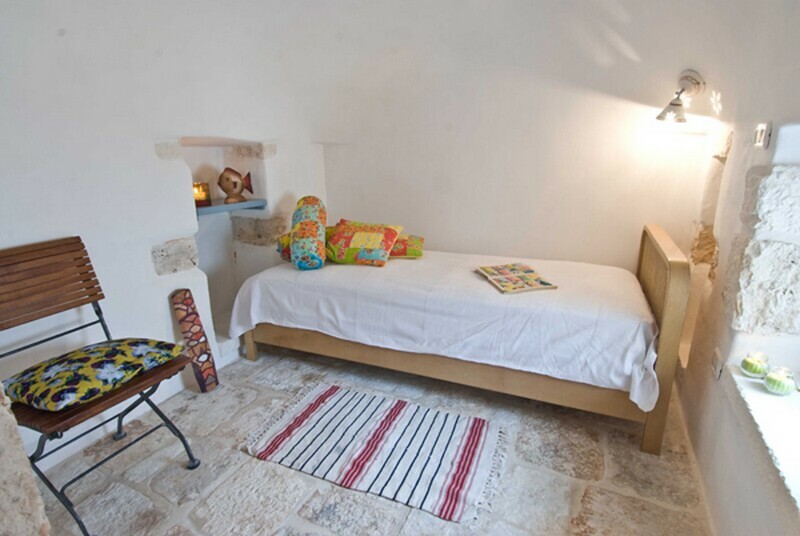 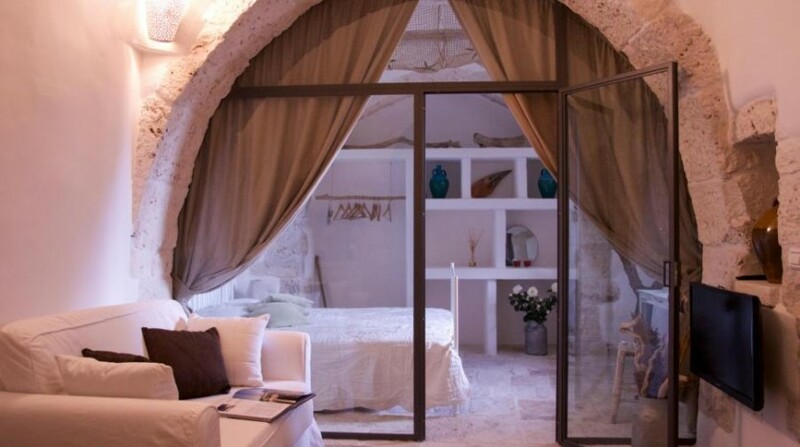 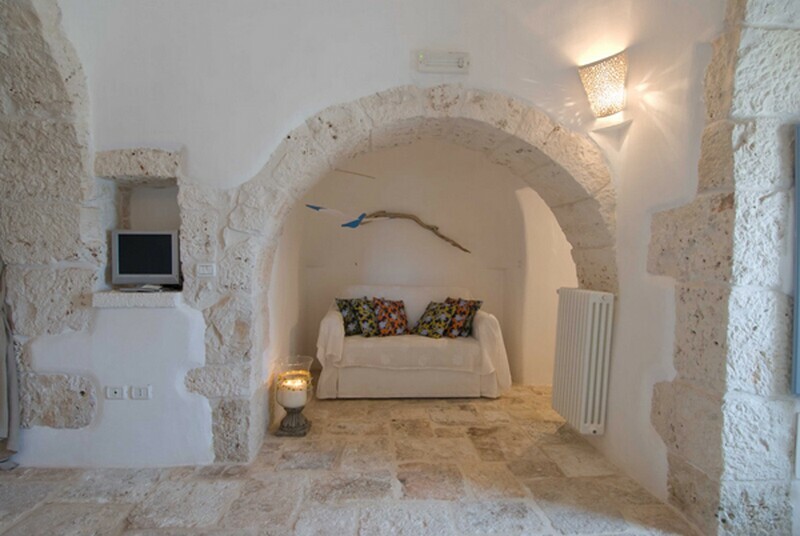 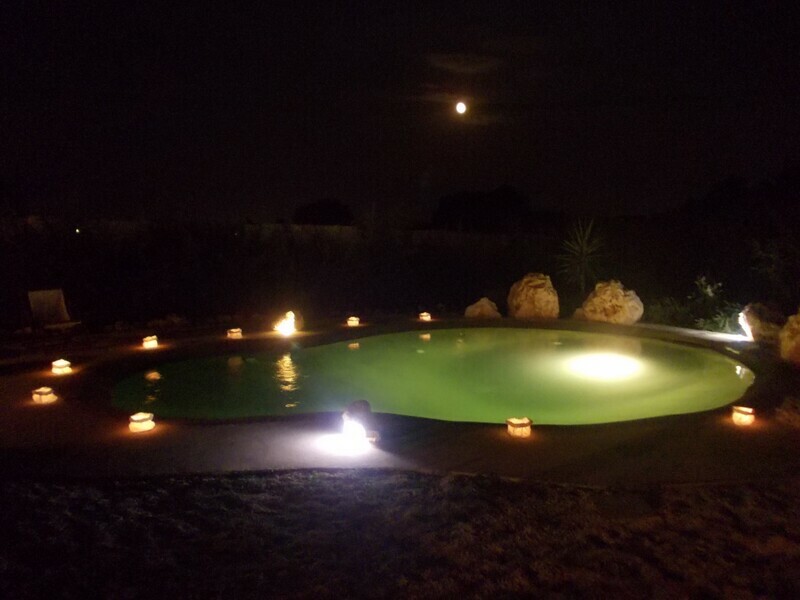 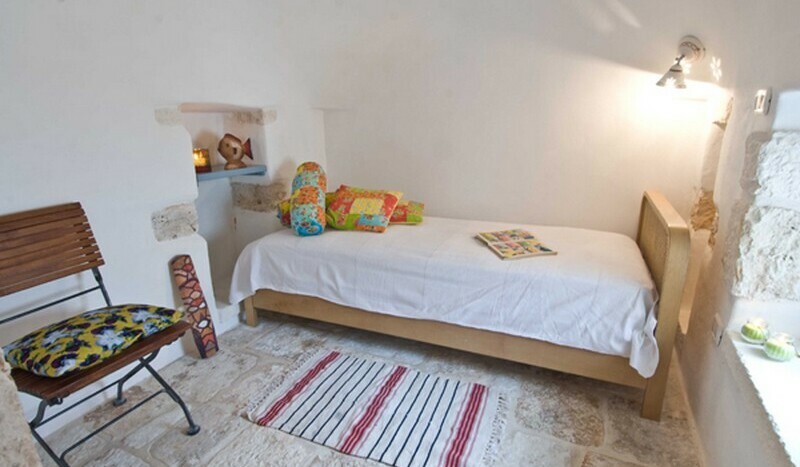 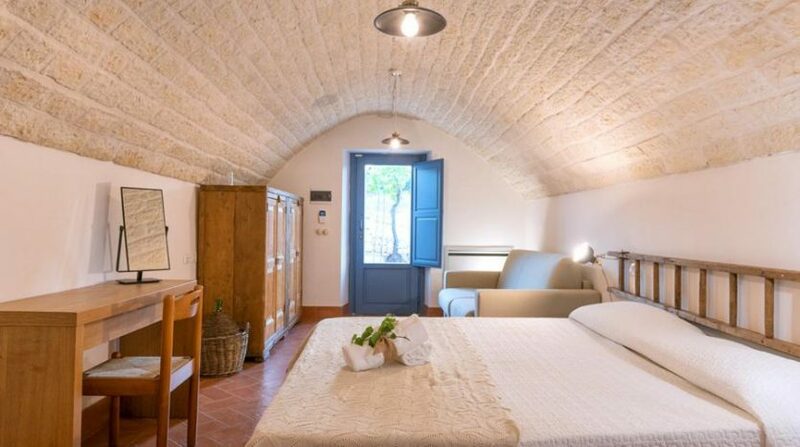 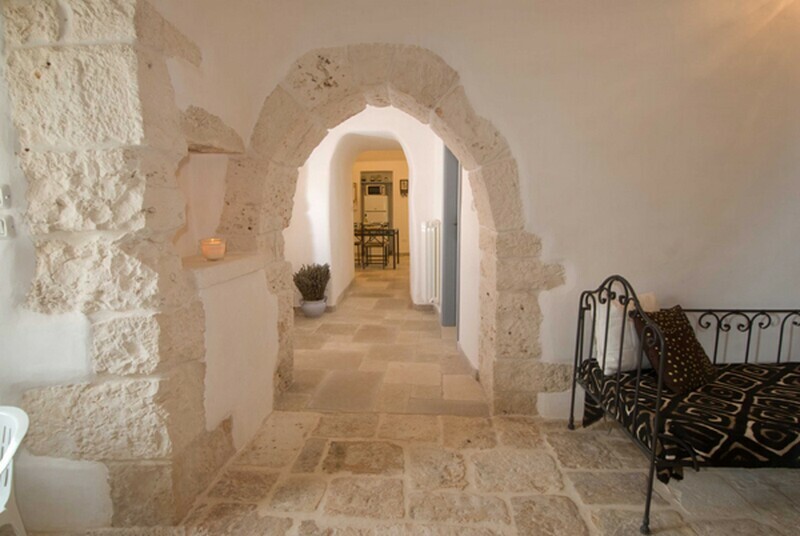 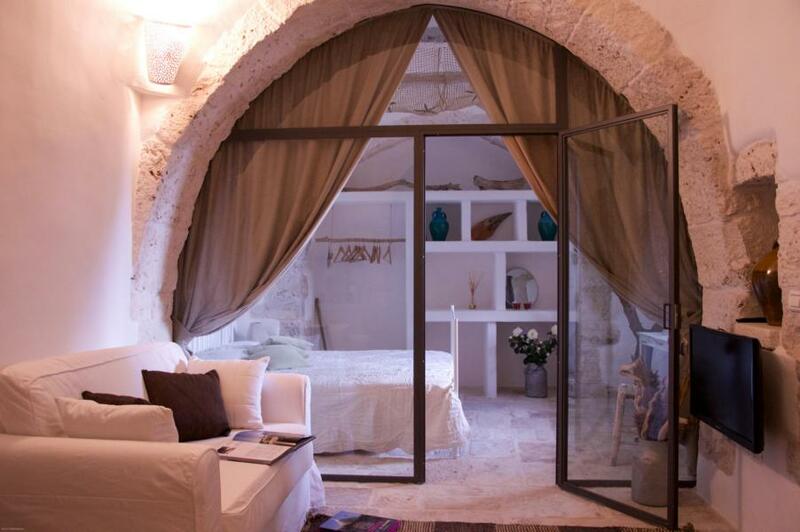 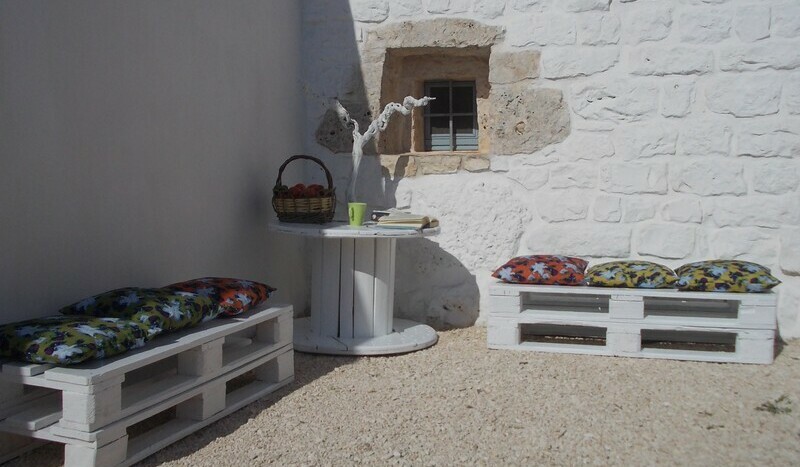 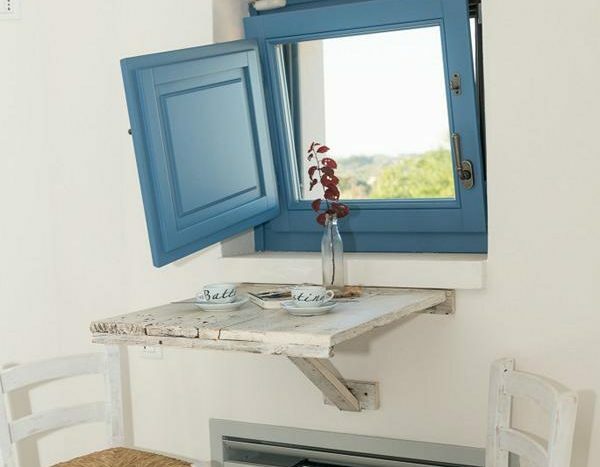 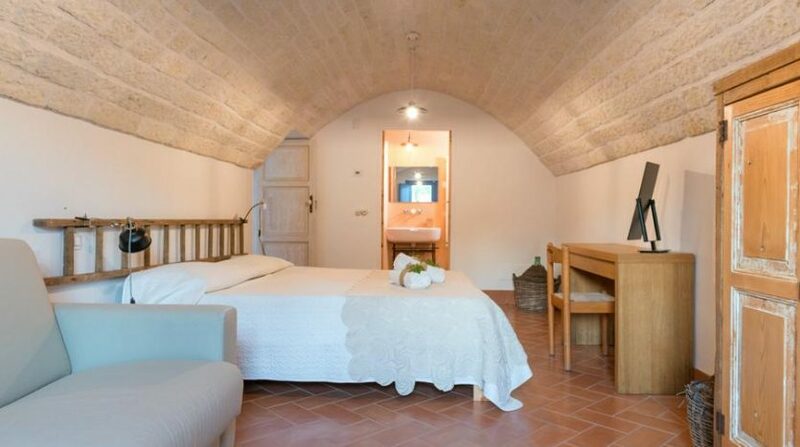 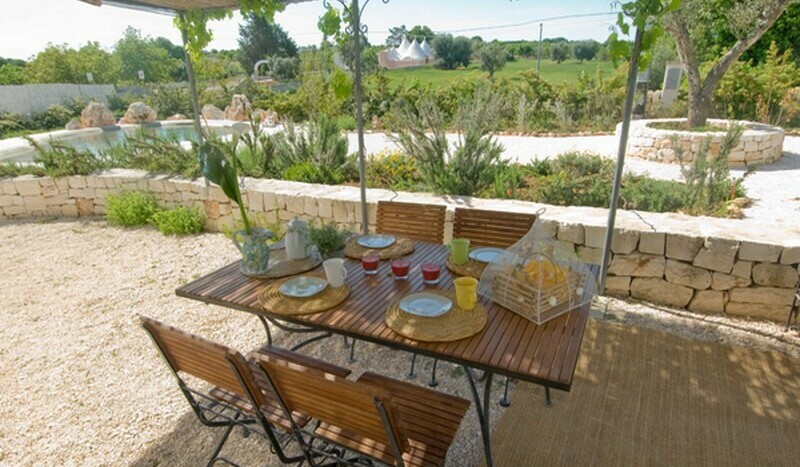 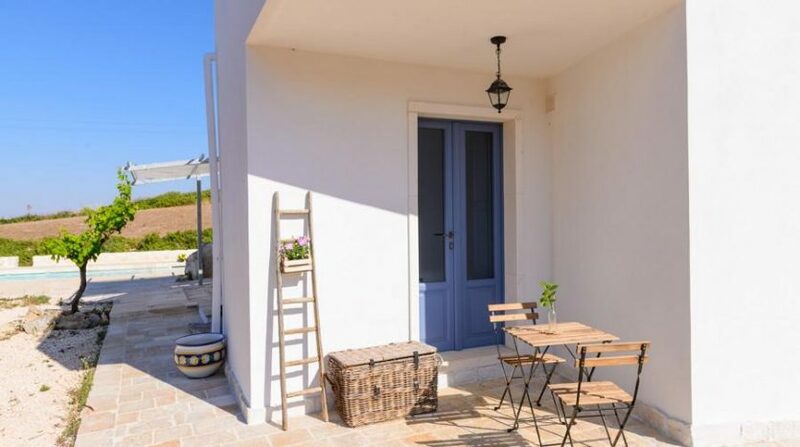 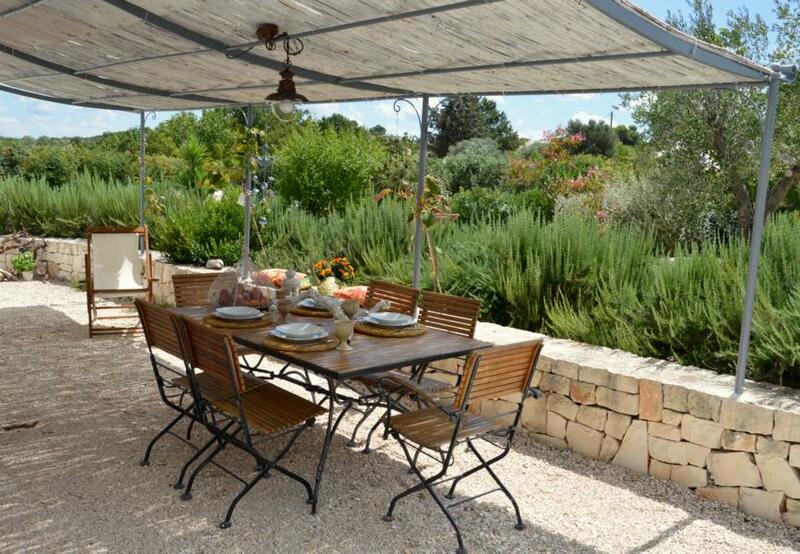 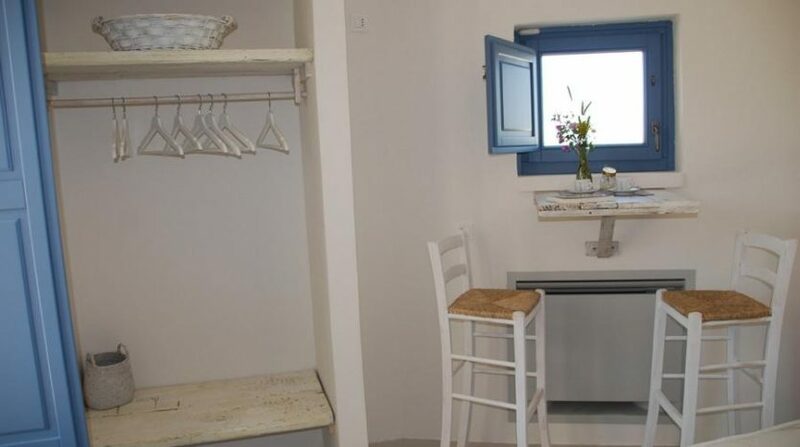 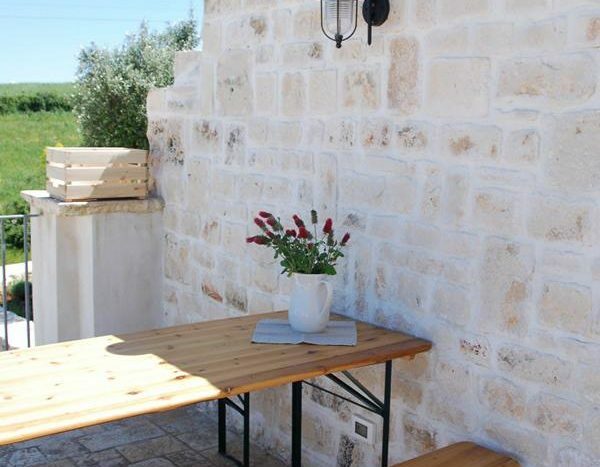 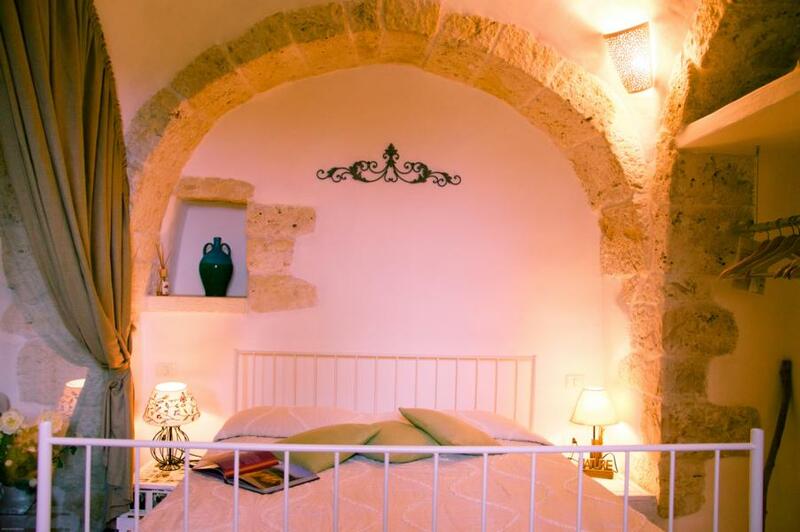 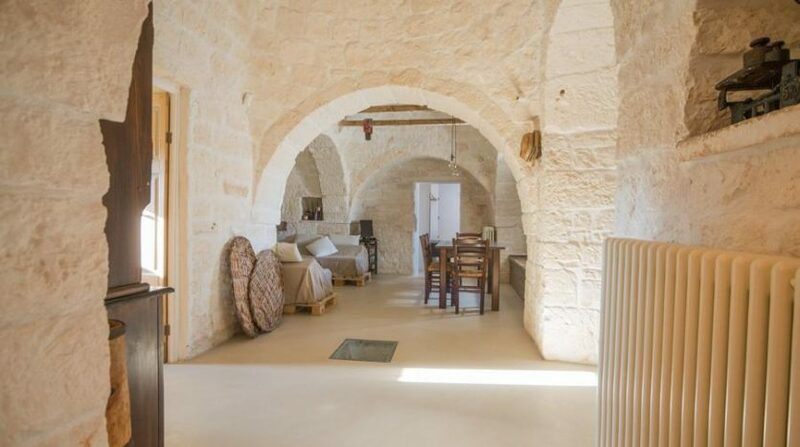 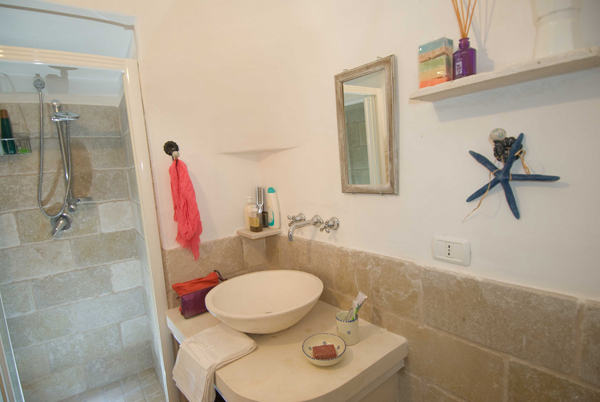 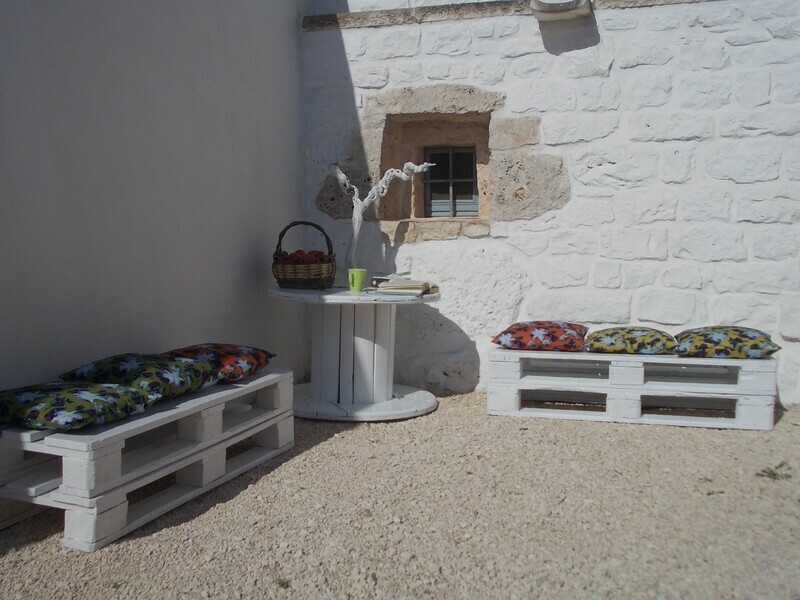 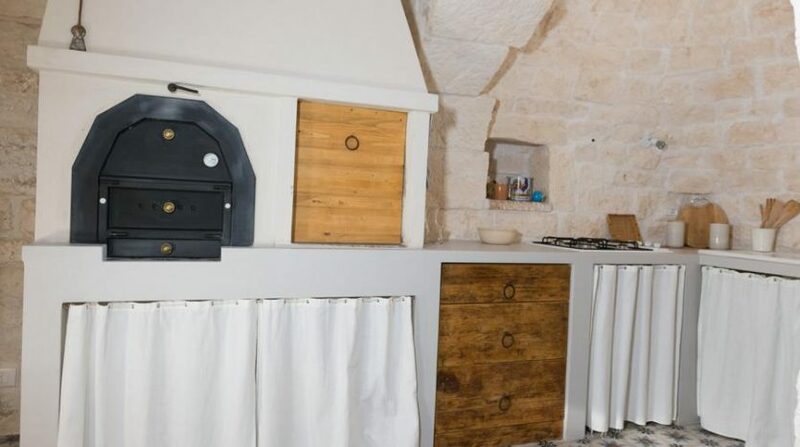 If you are looking for an original, traditional accommodation for your holiday in Puglia, we suggest you try Trullo Romantico. 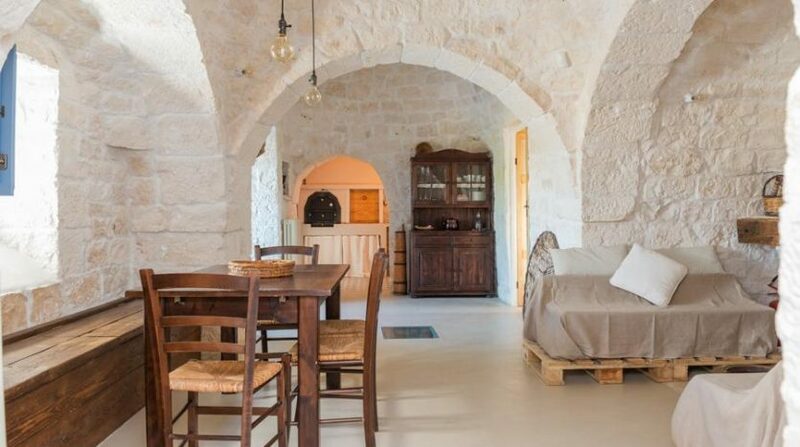 This Nineteenth-Century house, made of six cones and stone-made “lamie”, was tastefully restored in 2007 and has become a very comfortable and charming holiday house. 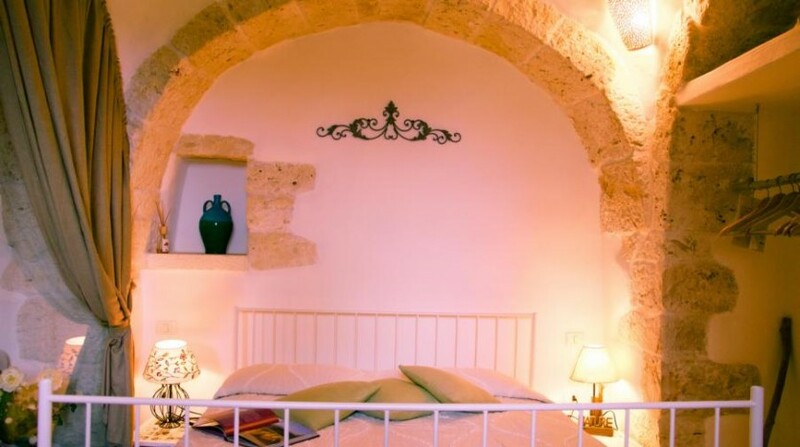 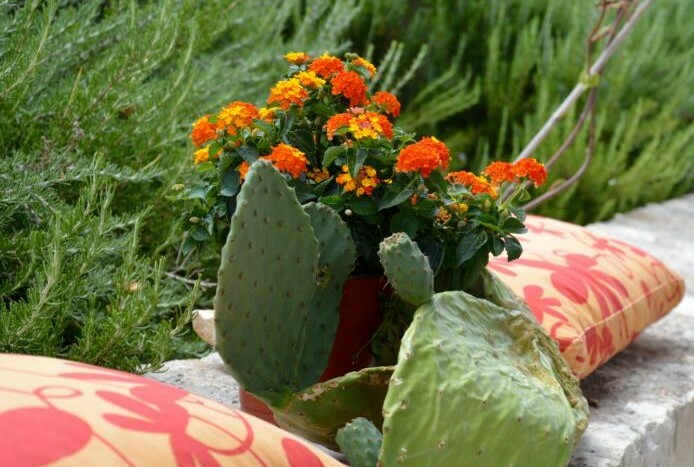 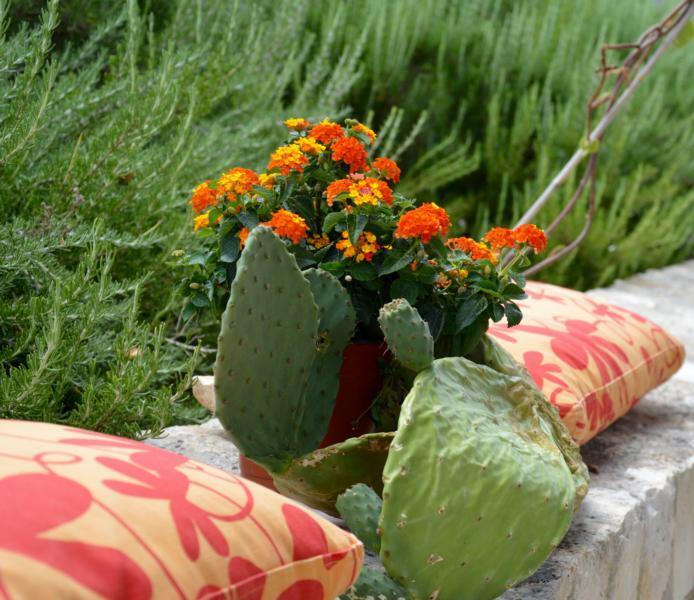 Colors are typical of the area, and the atmosphere is quiet and very pleasant – bright and fresh during the day, intimate and cozy at night, thanks to the ancient thick walls – as well as rich in delicate scents and flavors coming from the garden and its aromatic plants, such as lavender, rosemary, sage and thym. 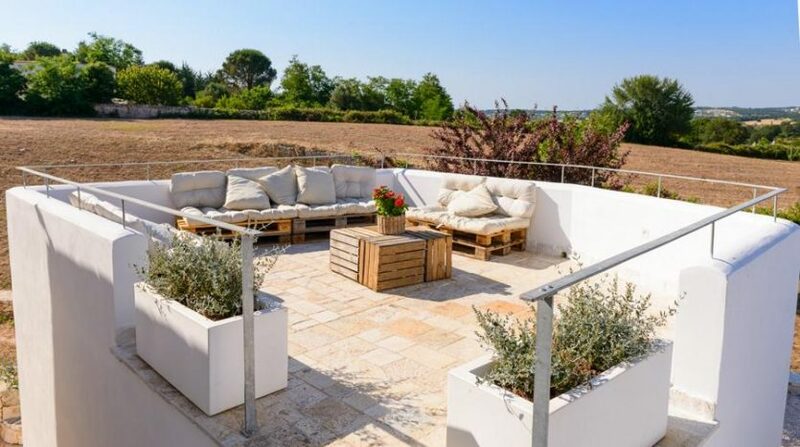 Outside spaces are wide and perfect for enjoying outdoor life: a scenic lake-pool made of natural quartz-sand that assures the natural effect of a beach with deck chairs and a shady porch, fully equipped for al-fresco dining. 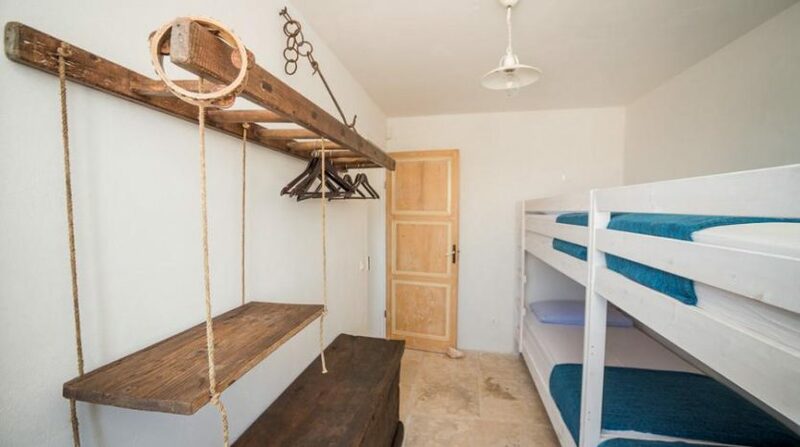 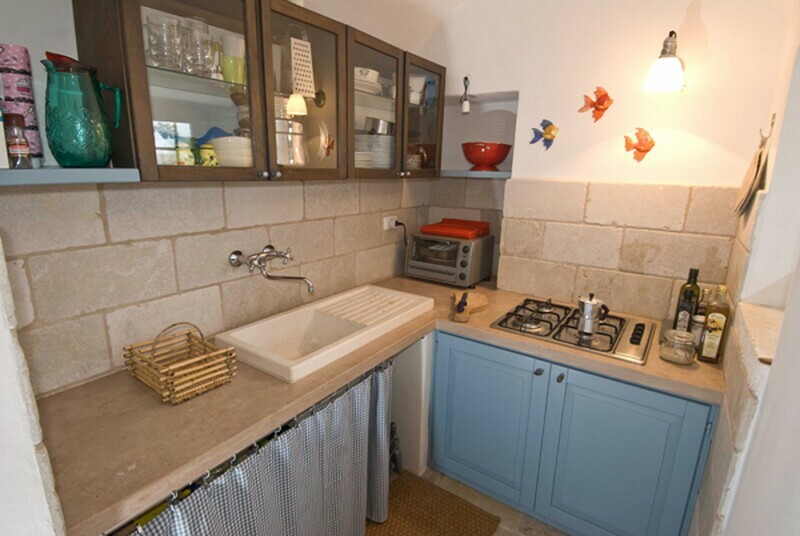 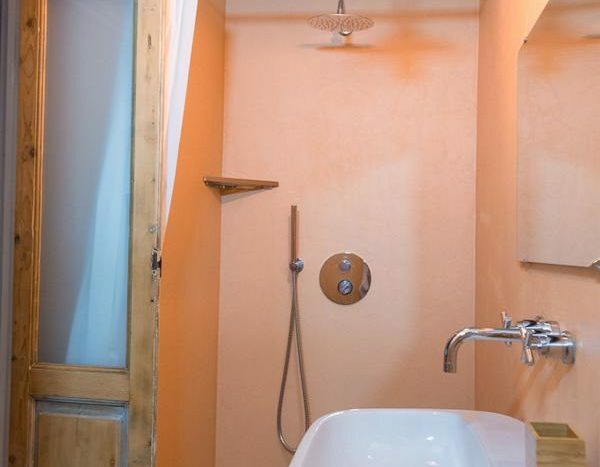 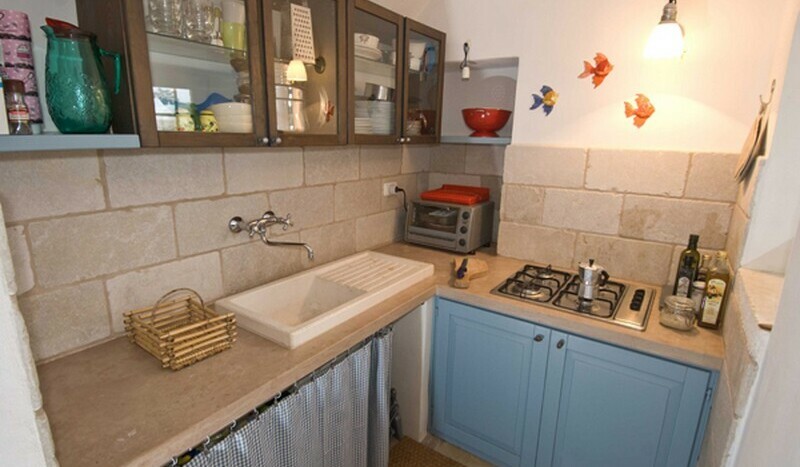 Inside, the atmosphere is rustic and comfortable – from the beautiful stone pavement to the practical pretty kitchen. 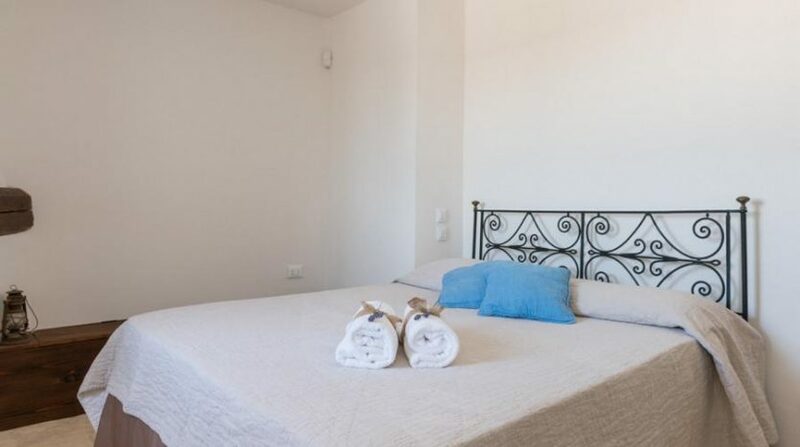 2 double Bedrooms,1 single bedroom and sofabed in the living and 2 bathrooms are well equipped and tastefully furnished with great care for details. 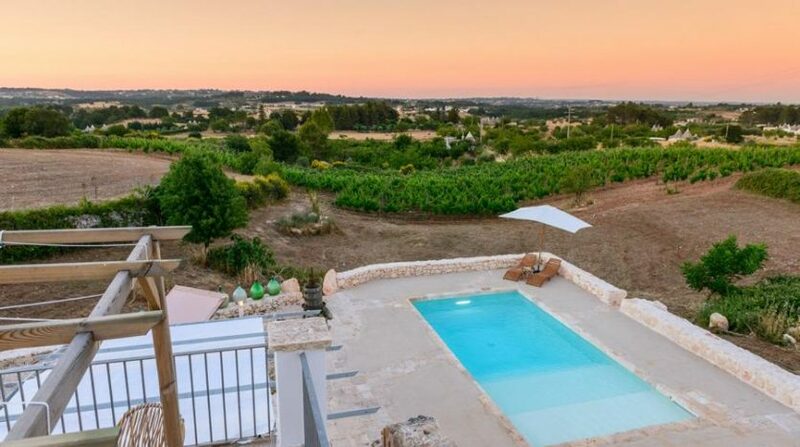 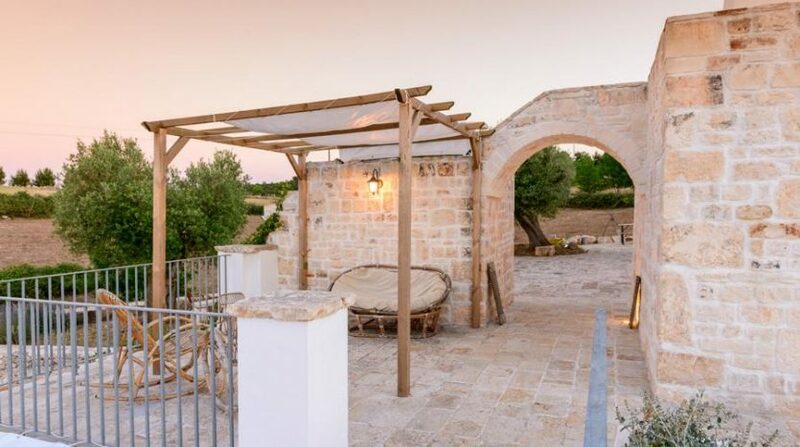 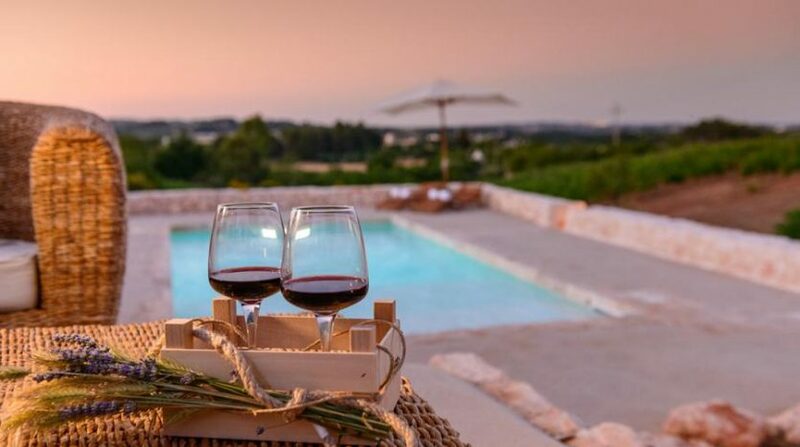 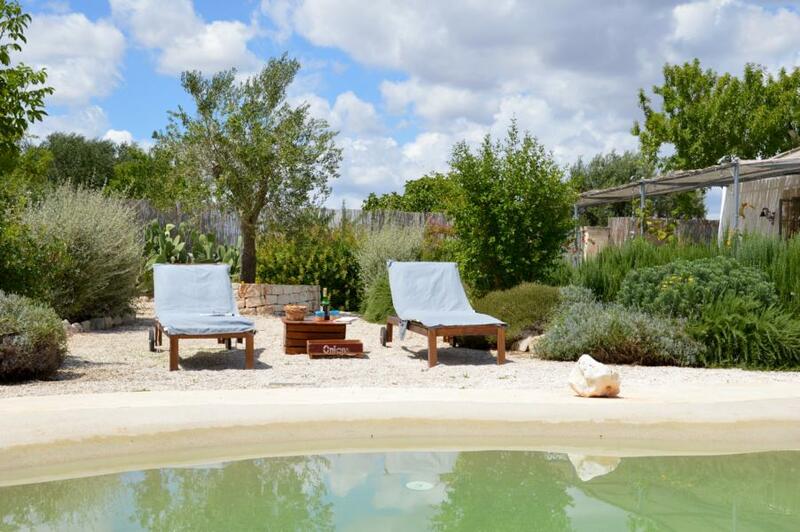 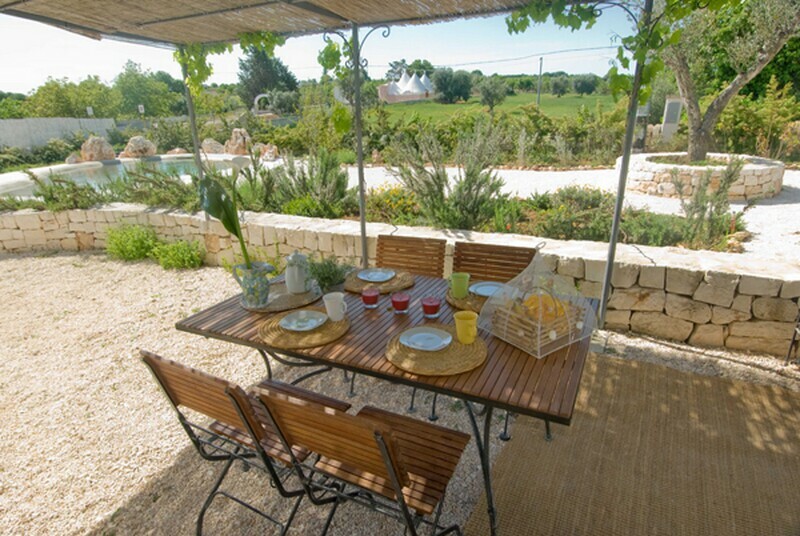 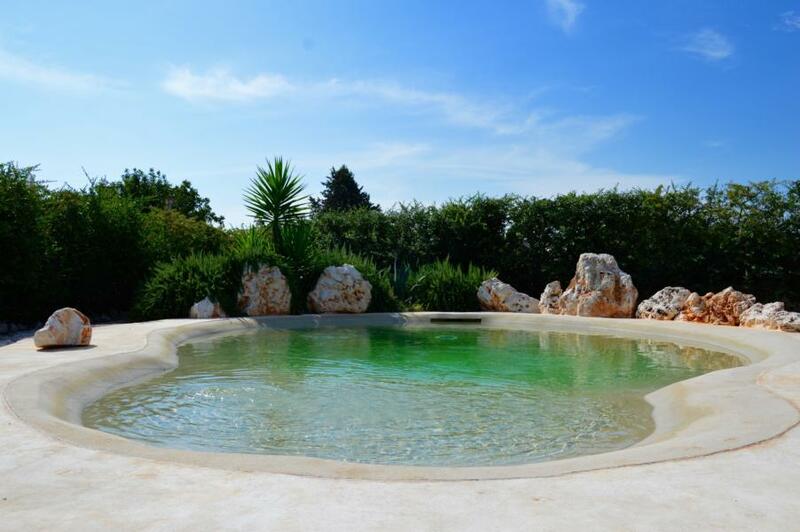 An extremely scenic accommodation in the most traditional Puglia house, in the very heart of the beautiful Itria Valley, surrounded by verdant vegetation and plenty of jaw-dropping places of interest: sounds like we have all the ingredients for an unforgettable holiday! 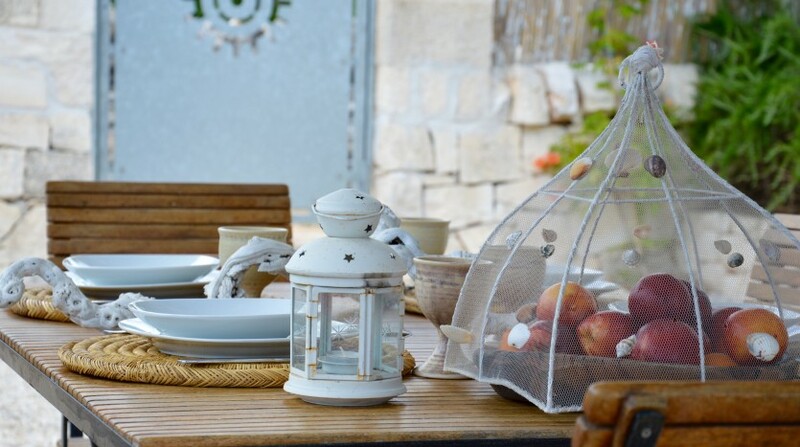 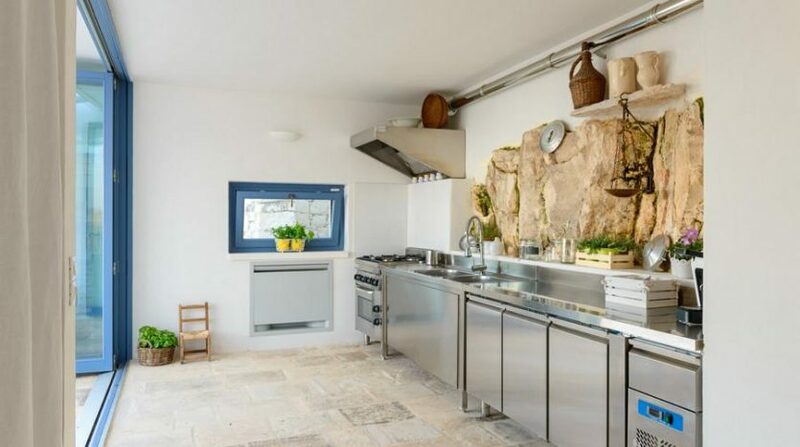 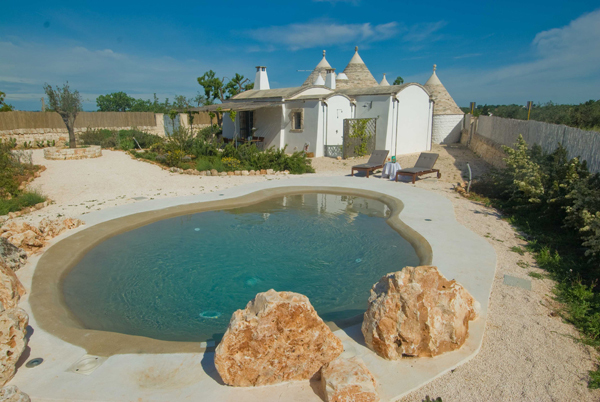 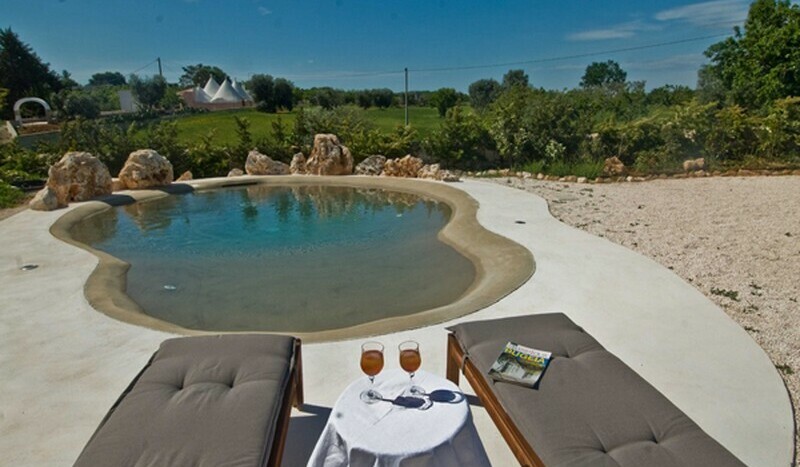 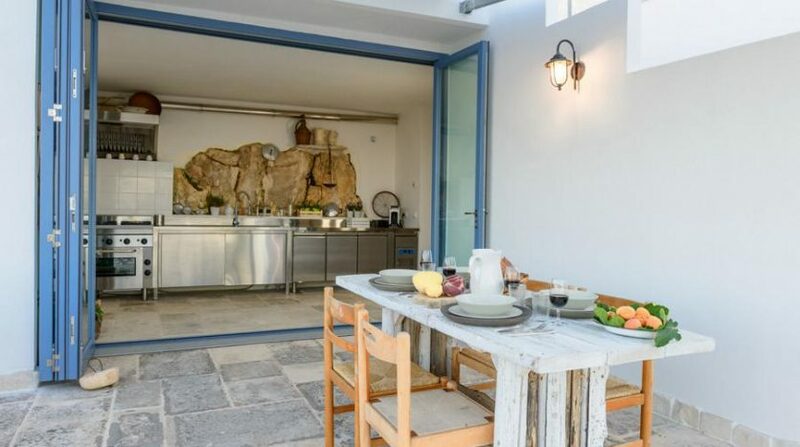 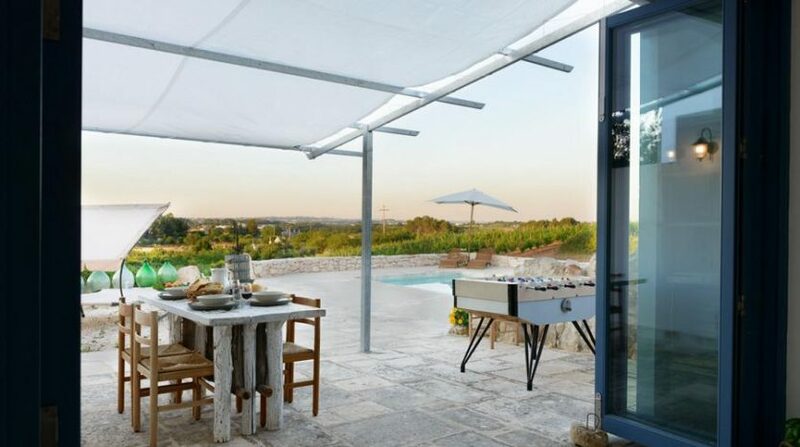 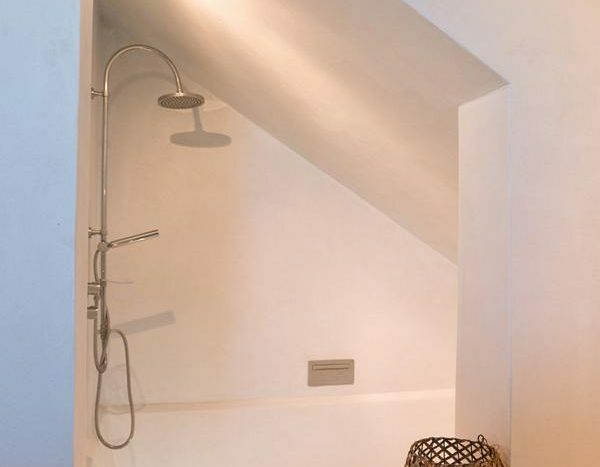 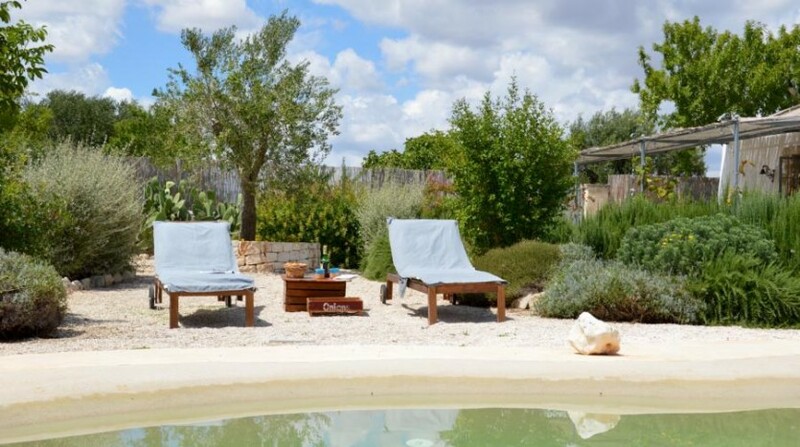 Trullo Romantico is set on a hilltop in the heart of the Itria Valley, a beautiful site rich in lush vegetation and most famous for its typical “trulli” conic-roof houses. 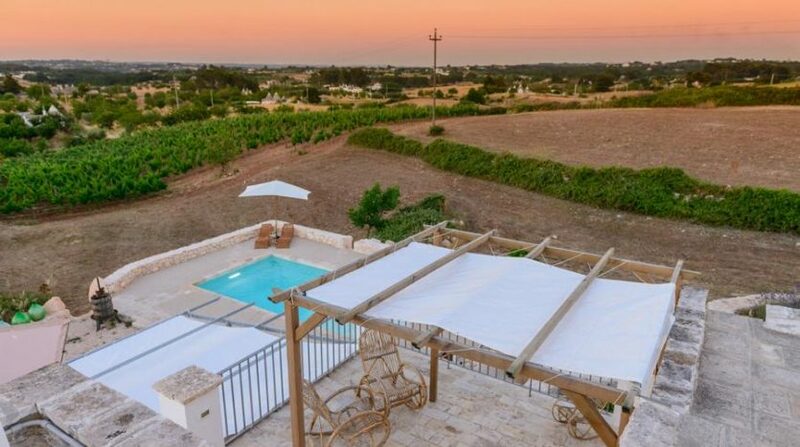 This peaceful area is perfect for those who are looking for relaxing, quiet holidays; nevertheless, it just takes a short drive to reach bigger towns, breaches, bars and other leisure sites. 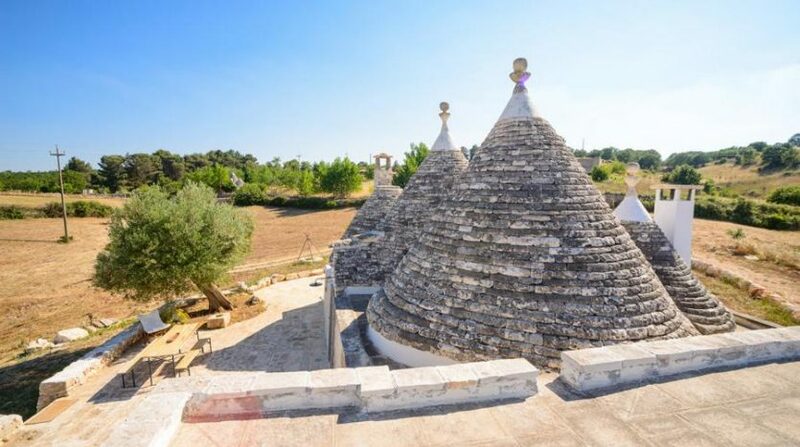 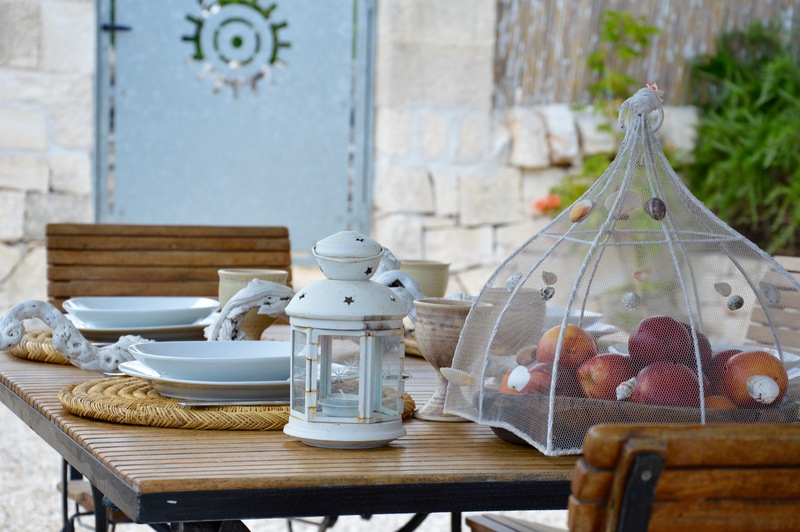 The nearest town is Cisternino, just 5 kilometers far: here you’ll find high-quality restaurants as well as many other useful services, and the stunning UNESCO World Heritage site of Alberobello is just 25 kilometers away. 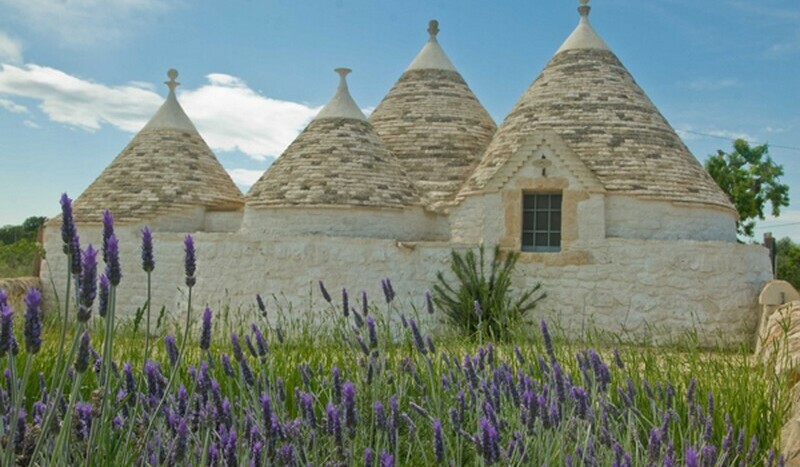 Don’t miss this enchanting town with its picturesque “trulli”, as well as other wonderful centres of the Itria Valley such as Ostuni, the “white town”, and Martina Franca, where a very famous lyric festival takes place every July and August. 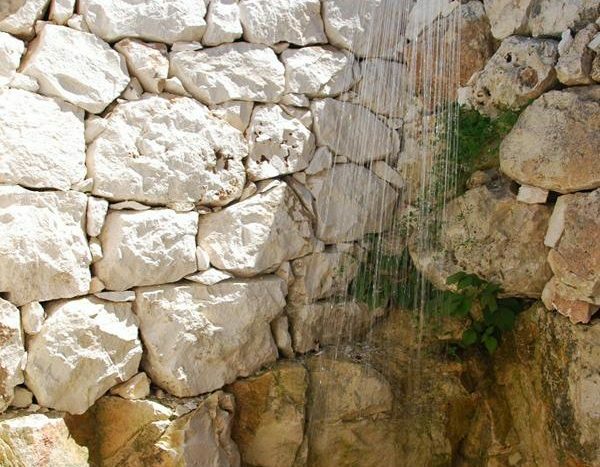 The nearest beach is just half an hour away (Villanova), and if you enjoy natural or archaeological parks we highly recommend a visit to the Castellana Caves: a breath-taking site, one of the most visited places of interest of the whole valley. 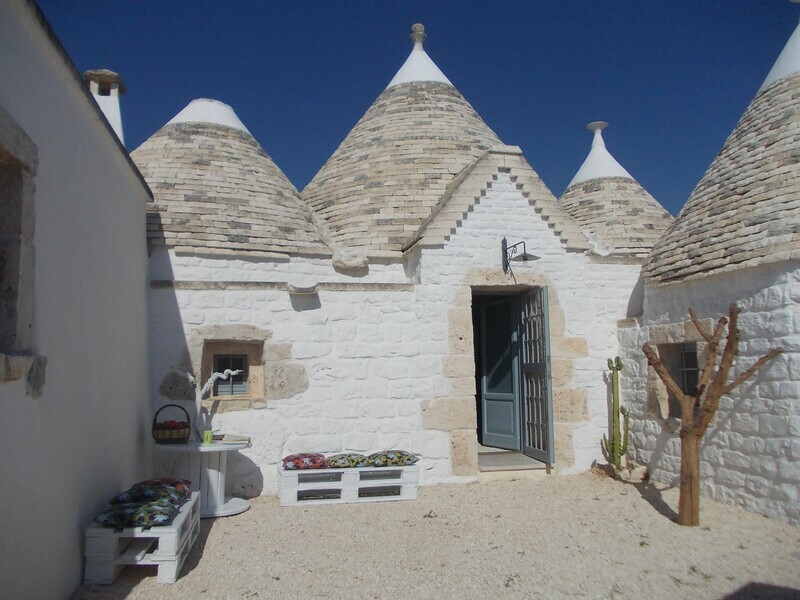 Car rental is highly recommended. 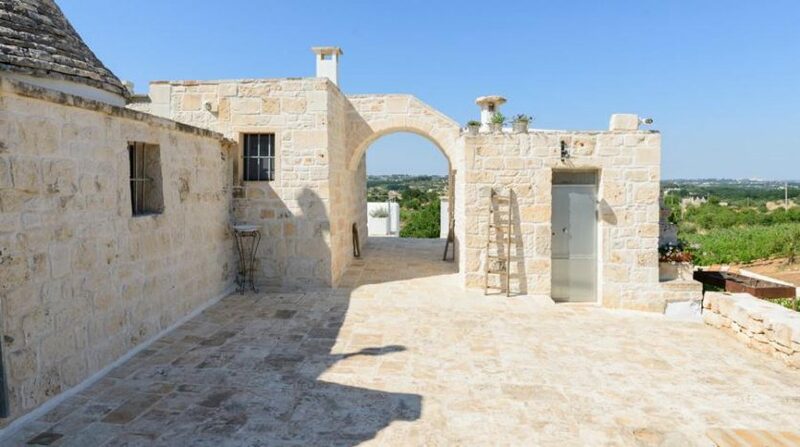 The nearest airport is 55 kilometers far (Brindisi/Bari), while the closest train station is in Ostuni (15km) and the nearest motorway is 33 kilometers away. 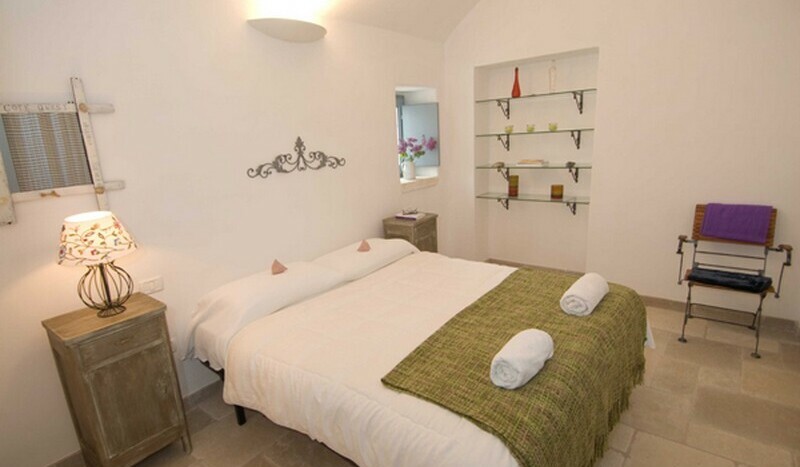 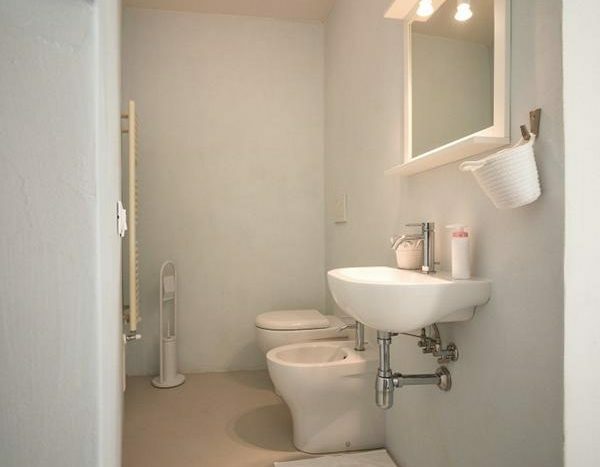 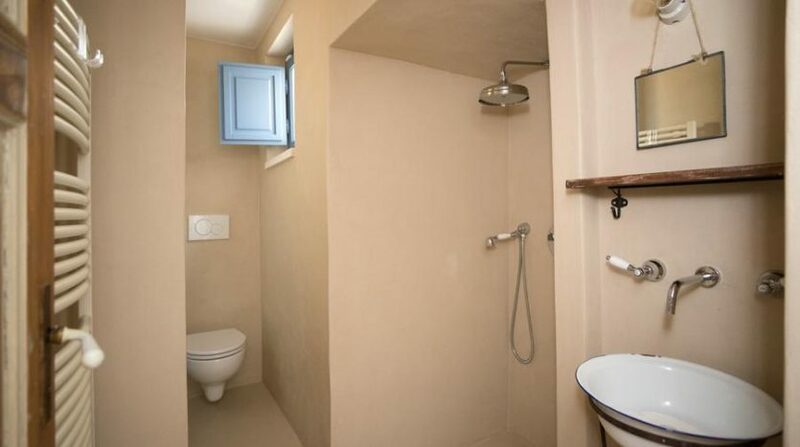 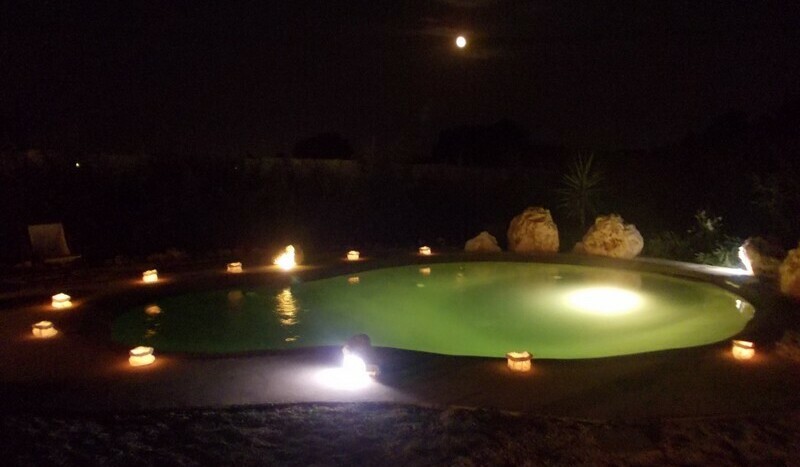 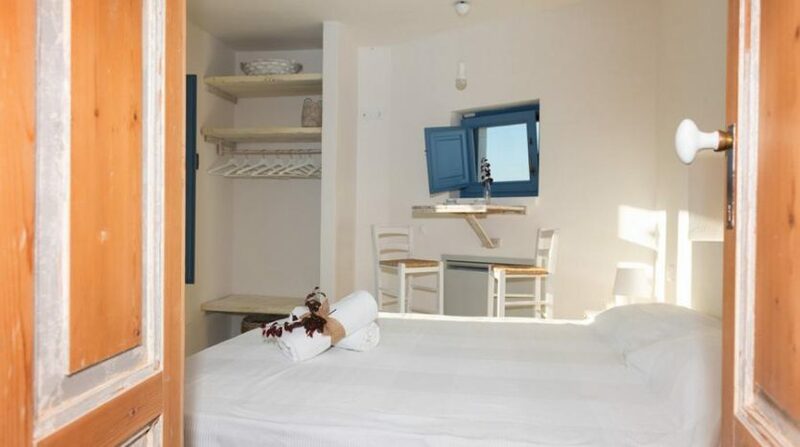 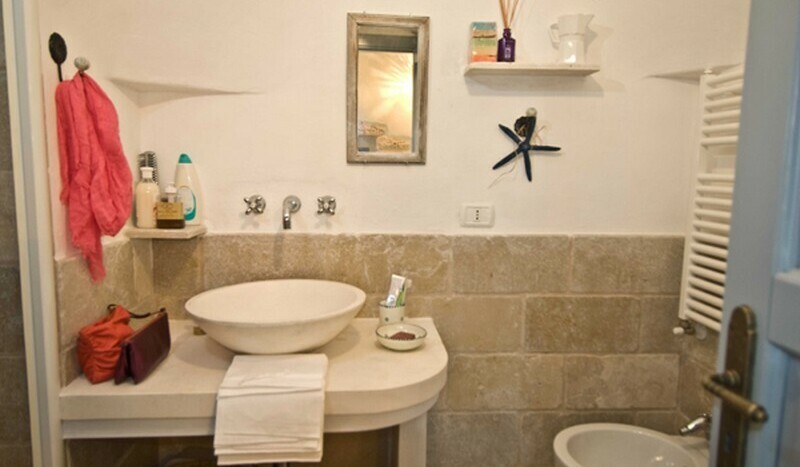 The weekly prices include the following services: – Linen – Towels – Gas – Water – Cot – Highchair. 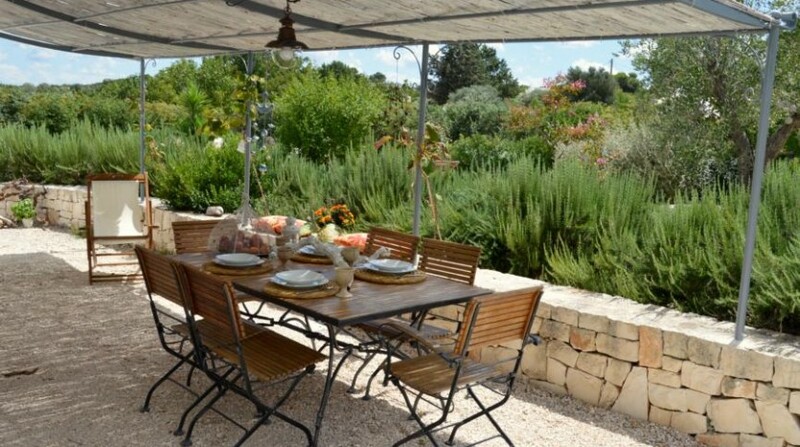 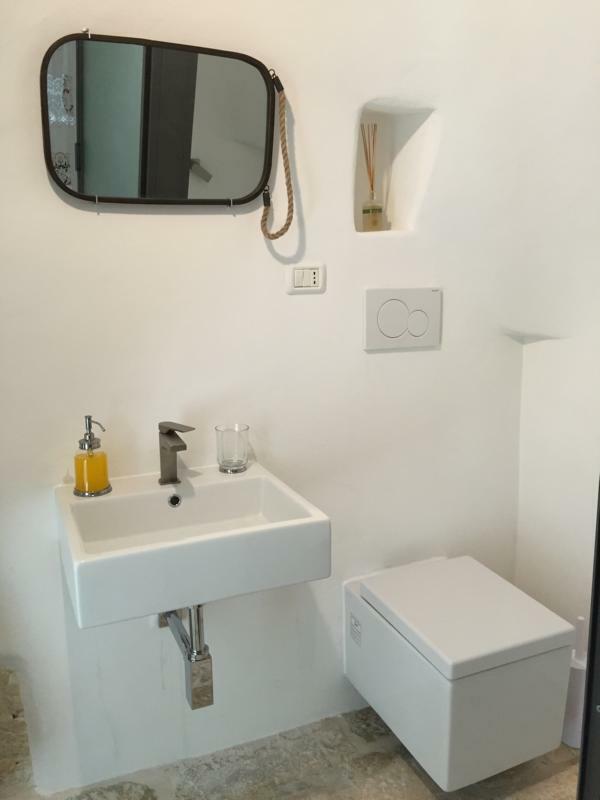 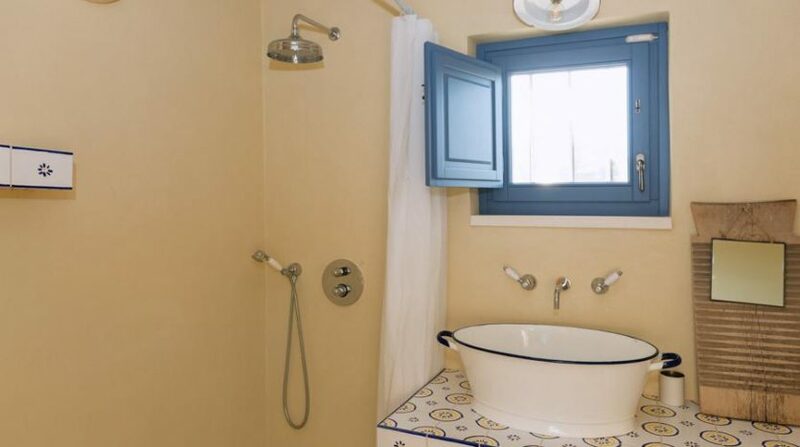 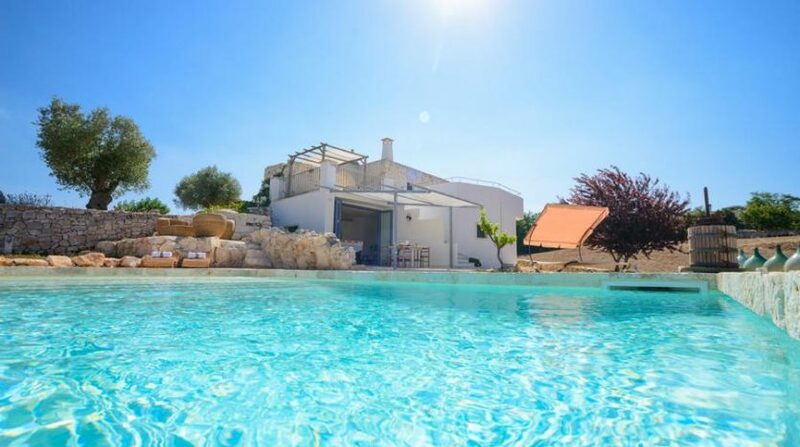 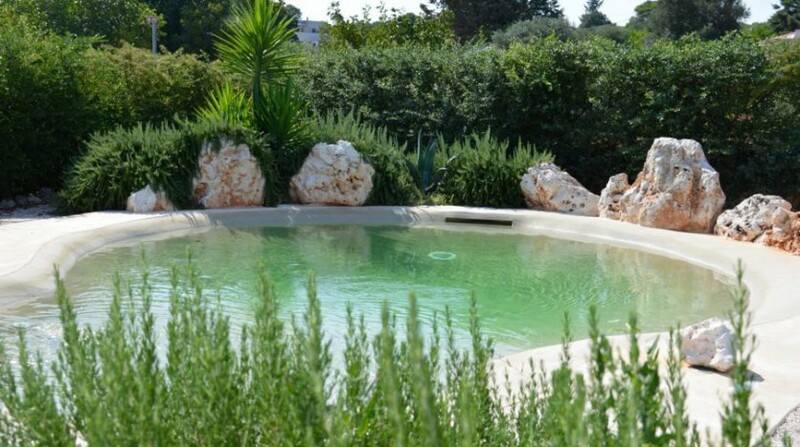 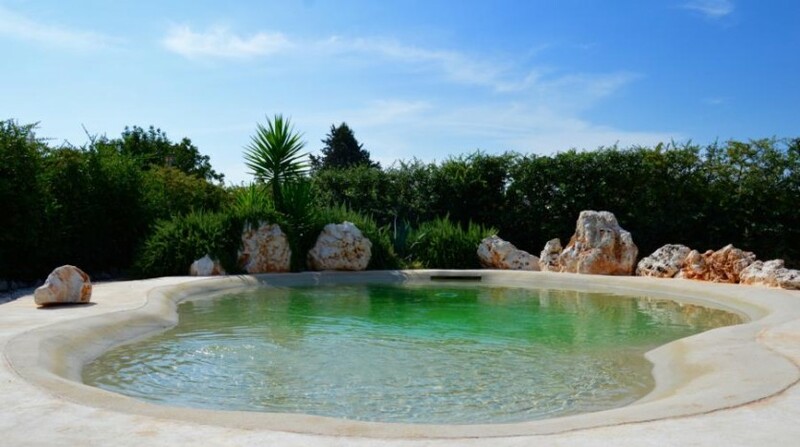 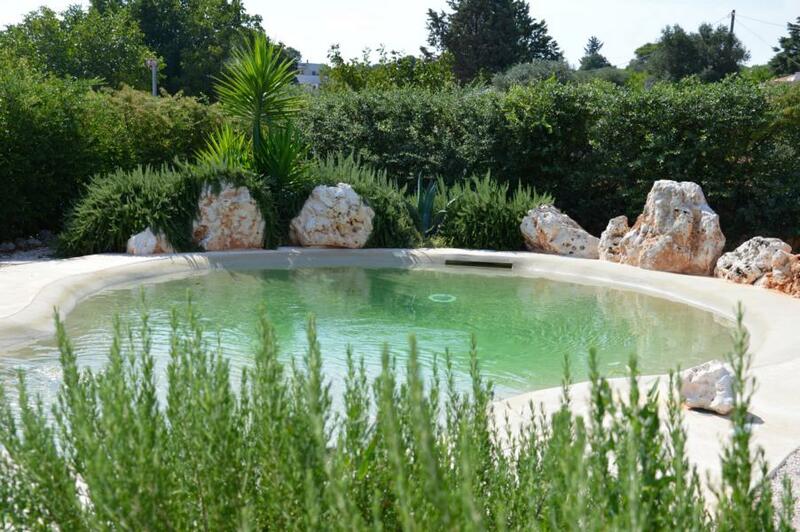 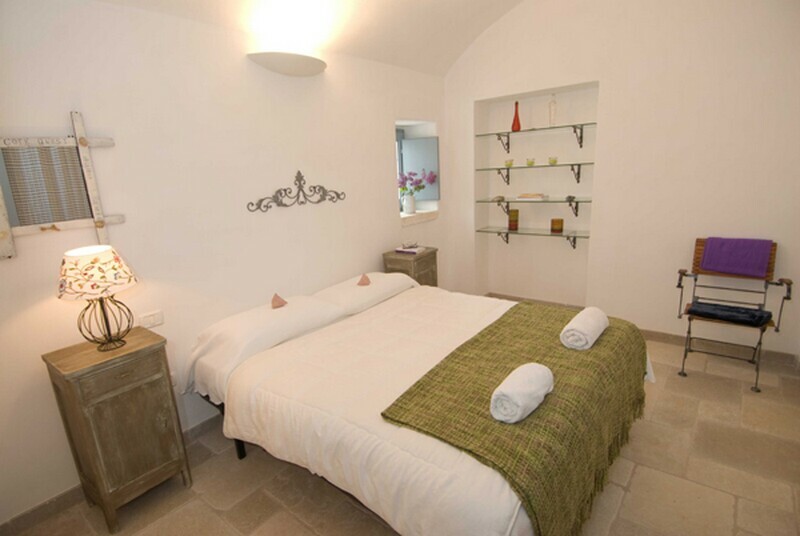 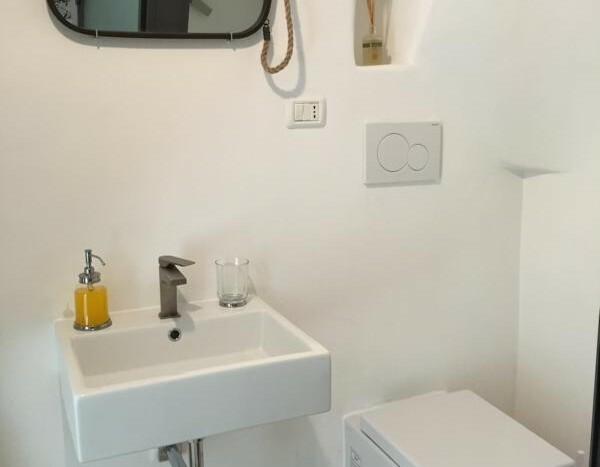 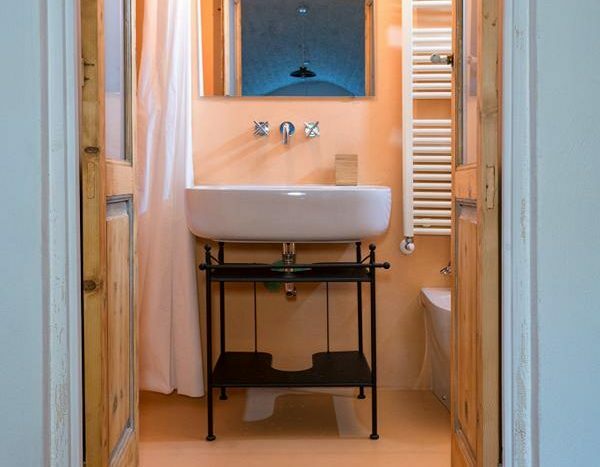 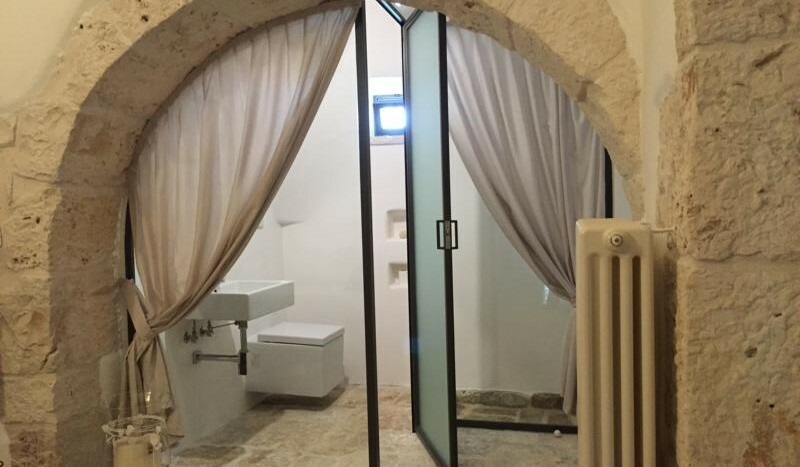 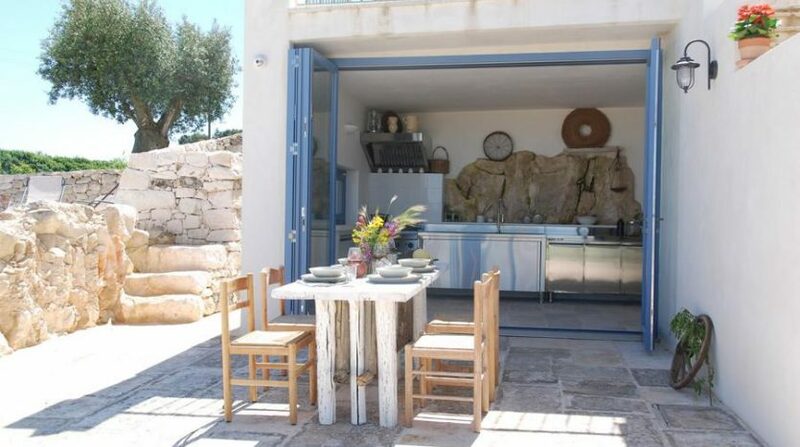 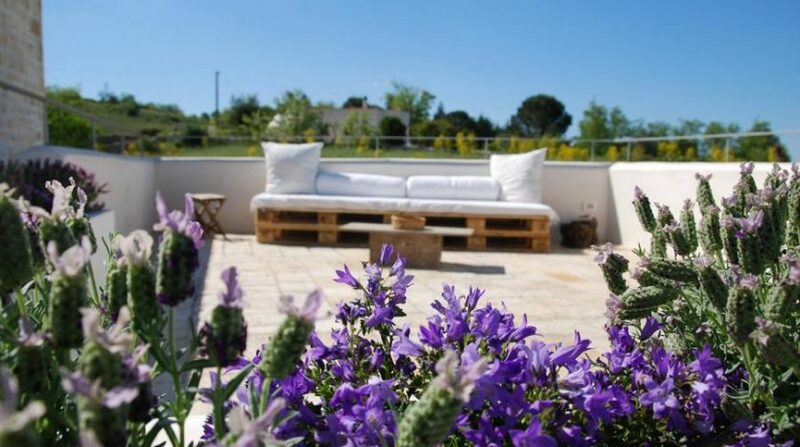 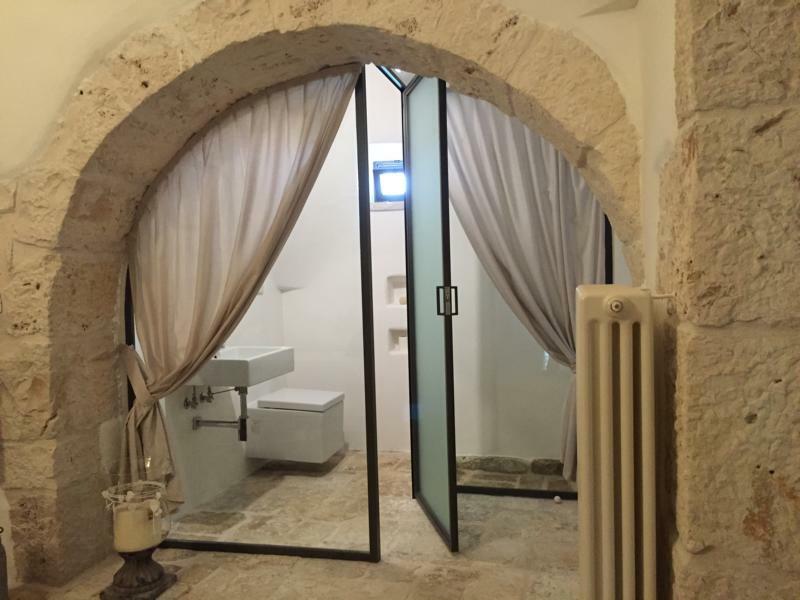 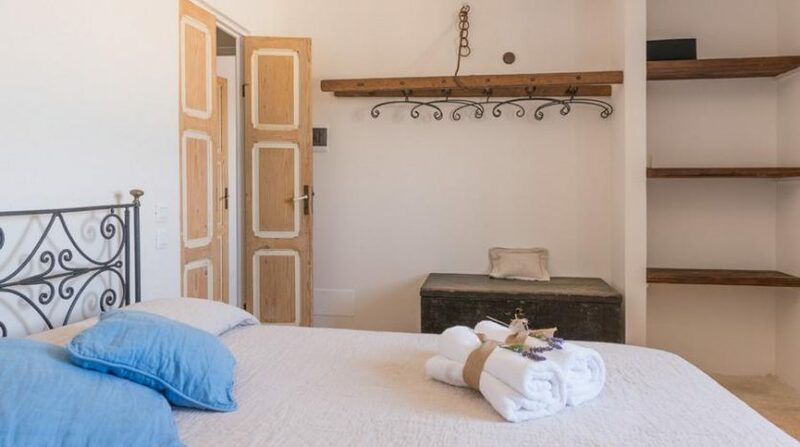 Address: The nearest town is Cisternino, just 5 Kilometers far: here you’ll find high-quality restaurants as well as many other useful services, and the stunning UNESCO World Heritage site of Alberobello is just 25 kilometers away.